This was always going to be a mixed bag. Heading to Europe, receiving bruising, and then getting some concessions for his case, Britain’s Prime Minister David Cameron’s attempt to renegotiate his country’s arrangements with the EU was not going to win many favours. It took the course of two days. Late on the evening of February 19th, Cameron concluded his renegotiation, announcing in the process that a referendum would be conducted on June 23rd on whether the UK should remain within or leave the EU. There were several sticking points, not least from eastern European states to Cameron’s insistence to cut in-work and child benefits to EU migrants to Britain. This violated the fundamental principle of mobility, ever the cornerstone of the European arrangement. As far as that was concerned, Cameron got approval for what is being termed an “emergency brake” that will allow the UK to stop in-work benefits for migrants for seven years, and cut child benefits for existing migrants from 2020. Whether this concession will be immune to legal challenge is quite another matter. Others included the attempt to seek exemption from the ultimate EU treaty goal of “ever-closer union” (opposed with some determination by the Belgians) and an understanding that countries outside the Eurozone be protected from decisions made by those in it. Cameron did get, rather reluctantly, agreement to a “red card” mechanism which enables national parliaments to block various EU laws. The understanding here is that Britain not play the role of meddler in attempting to convince other states to not move towards the goal of ever closer union. The Tory London Mayor, Boris Johnson, has similarly gone for the simple route, despite agonising, in characteristic confusion, over which way to go. His argument is pegged to the idea that the vote will somehow spur genuine reform. It is not that he resents Europe, a continent of culture he admits to adoring. He resents, rather, “the political project of the European Union”. Not that all of Johnson’s points should be dismissed. The project in 28 years, he argued “has morphed and grown in such a way as to be unrecognisable”. The Qualified Majority Voting mechanism has been rendered less effective for Britain, a country that “can be overruled more and more often”. The result is “legal colonisation” that is unsanctioned by parliament. The Greeks, among others, would certainly agree with that one. Ultimately, it is the simple, hand bag falseness of the debate that will count. The economy is certainly up there, reduced to the issue of whether Britain’s competitiveness will be affected by moving outside the EU framework. An unreformed European bureaucracy, lack of coherent policy, drowning refugees, for one, and the general sense of migrants overall will also stir up various parts of the population. Not that Britain needs to have concerns – the so-called hordes in Britannia have finally allowed the rich to get their conservatories, the bathrooms to be finished on time, the plumbing to be tended to. 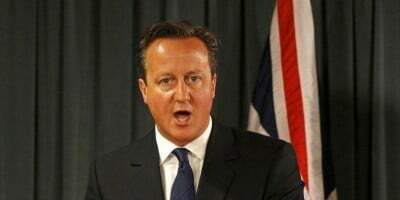 There is a sense that Cameron’s gamble is one that emphasises minor change for maximum illusion. The “In” campaign may have the legs to carry it come June, though stating it with such clarity, as The Economist does, is always a risky proposition. “The Out camp may have Mr Gove and perhaps Mr Johnson, but otherwise it is a bunch of cabinet no-names and fringe eccentrics.” Given the fortune-favouring the brave voice of Johnson, however, and the dangers for Cameron’s stance become all too apparent.